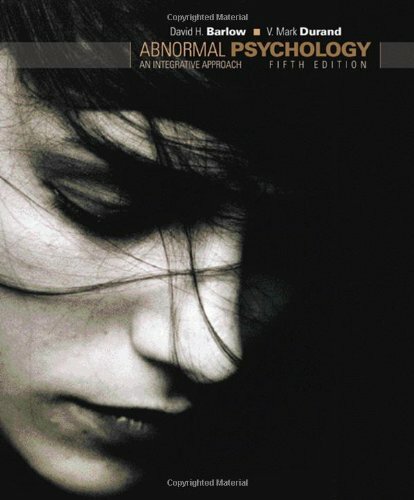 ABNORMAL PSYCHOLOGY: AN INTEGRATIVE APPROACH, Fifth Edition, is the perfect text to help you succeed in your abnormal psychology course! Authors Barlow and Durand show you how psychological disorders are rooted in multiple factors: biological, psychological, cultural, social, familial, and even political. You can test your understanding of topics with the text's built-in concept checks and chapter quizzes. Then, watch the text's integrated case studies come to life with CengageNOW™ for Abnormal Psychology, which provides real case profiles to give you a realistic context for the scientific findings of the book. David H. Barlow is an internationally recognized expert and leader in clinical psychology, having pioneered many treatments and investigations in anxiety and mood disorders. Currently Professor of Psychology and Psychiatry at Boston University, Dr. Barlow is also founder and Director Emeritus of the Center for Anxiety and Related Disorders, one of the largest research clinics of its kind in the world. Previously, he was distinguished professor at State University of New York at Albany. From 1975 to 1979, he was professor of psychiatry and psychology at Brown University, where he also founded the clinical psychology internship program. From 1969 to 1975, he was professor of psychiatry at the University of Mississippi, where he founded the Medical School psychology residency program. Dr. Barlow received his B.A. from the University of Notre Dame, his M.A. from Boston College, and his Ph.D. from the University of Vermont. He is the recipient of a Lifetime Achievement award from the American Psychological Association and is a fellow of the American Psychological Society.